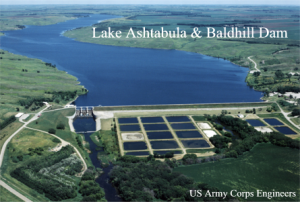 St. Paul (Feb 26) – The US Army Corps is currently lowering the elevation of Lake Ashtabula, located near Valley City, ND. The current elevation is 1,260.0 feet NGVD29, and it will be further drawn down as far as 1,255 feet NGVD29. St. Paul – The U.S. Army Corps of Engineers, St. Paul District, began increasing releases from Baldhill Dam on the Sheyenne River near Valley City, North Dakota, Wednesday due to recent snow water equivalency measurements. As of the morning, of Feb. 6, Lake Ashtabula’s pool elevation was 1,262.8 feet and releases were increased to 150 cubic feet per second, or cfs. Based on our operating procedures, we target a drawdown of the reservoir’s pool to 1,255 feet by April 1 to allow capacity for snowmelt. Releases from the dam will be increased gradually to 250 cfs. Additional releases to as much as 400 cfs may be necessary to reach the target pool elevation. PUBLIC SAFETY: Everyone is urged to use caution if on the Sheyenne River, as the increase in flows from Baldhill Dam will change downstream ice conditions.